By the time you receive this, the daytime temperatures will remain below freezing most days, and it�s possible that we�ll have as much as a foot of snow on the ground. While lows in the single digits and teens are likely, it could be as low as -10°. Winter hits hard and fast! The months of autumn are times of high expenses for our mission, but they�re also times when donations are weak. Every day, we pray that we will be able to meet our bills. We thank you especially right now for your generosity and your prayers! top THE LIGHTED CROSS of Old St. Joe�s is located at the center of Nome. Constructed in 1901 during the height of the gold rush, the church was deconsecrated in 1945. It was hauled to the northern edge of town and used by the local gold company as a warehouse for the next fifty years. With Nome�s centennial on the horizon, city planners moved the structure to the site of the demolished elementary school and restored it to its original appearance. That included construction of a new steeple, the cross topping 100 feet above ground. In 1901, the newly incorporated City of Nome voted against paying electricity for the lighting of the cross; though following their meeting, councilmen passed the hat and subsidized it privately. Today, the cross, the pinnacle of this historic building, is lighted by the city and visible for three miles on the open tundra. INSPIRATIONAL SPOT: So far today, God, I�ve done all right. I haven�t lost my temper, haven�t gossiped, haven�t been greedy, grumpy, nasty, selfish or overindulgent. I�m really glad about that. But in a few minutes, God, I�m going to get out of bed, and from then on, I�m going to need a lot more help! Thank you, in Jesus� Name, Amen. top Meet KNOM volunter Vicki Muzik (left). As Production Director, Vicki supervises our educational spots, and she also announces the morning show. From Cleveland, Vicki is 22 years old, a Religion graduate of Westminster College in New Wilmington, PA.
Quick with a smile and a good word, Vicki enjoys playing trumpet, cooking, and "hanging out with the group... because they�re pretty swell individuals!" INSPIRATIONAL SPOT: A Bible in the hand is worth two on the shelf. top YOUR PRAYERS ARE REQUESTED for six Diomede Islanders, including a 6-year-old boy, who are believed dead. The six were on a 20-foot boat, sailing the treacherous 25-miles of Bering Strait from Wales, at the tip of Alaska, to Little Diomede. Such travel has been common since the earliest memories of the oldest-timers, and until last month, there had never been an accident. However, in early September, the boat was last seen weathering 12-foot seas and never made it to the island. A search of 70,000 square miles of ocean and of both the Alaskan and Russian coasts has turned up nothing. INSPIRATIONAL SPOT: As white snowflakes fall quietly and thickly on a winter day, answers to prayer will settle down upon you at every step you take...the story of your life will be the story of prayer and answers to prayer. top ...AND COUNTING... Since the first of the year, KNOM has broadcast approximately 25,500 Inspirational Spots, and an equal number of educational ones! "STOCK" ANSWER: All gifts to KNOM are tax-deductible. In this bouncy stock market, several friends have asked how they can make gifts of stock. We always use major gifts for replacement of equipment, or place them into emergency savings. Their address is 215 Cushman Street, Fairbanks, Alaska 99701, phone 907-451-7767, DTC number 733. Both Mr. Hughes and KNOM General Manager Tom Busch should be notified in writing that the gift is intended for use by Alaska Radio Mission - Station KNOM. (Gifts of cash can be donated directly to KNOM at our Nome address.) May God bless you! *editor's note: this account number is different from that published in this edition. It is the correct number as of January 2001. TWENTY-FIVE YEARS AGO: One October day in 1973, Father Harold Greif, SJ boarded a Cessna 180 for the village of Shishmaref, where he received permission to board the Bureau of Indian Affairs supply ship "North Star," headed for Little Diomede Island with the body of a woman destined for burial. 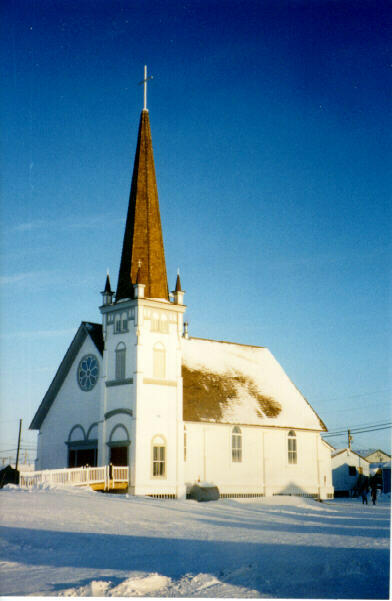 Father Greif was lightered to the island on a small boat, held a funeral which the entire population of the remote village attended, promptly reboarded the "North Star" for the village of Wales, went ashore and caught another small plane back to Nome...for a 73-year-old bush Alaska priest, all in a day�s work! We read about the drop in the price of oil and gas products around the country. In Nome, fuel oil is down to $1.59 a gallon, and gasoline is $1.99 to $2.04. In the villages, it can be three to four times that expensive, due to the high costs of shipping. 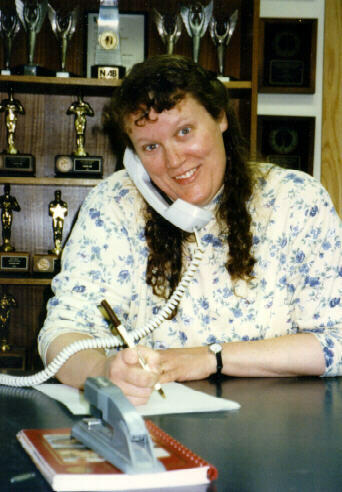 If you�re a long-time KNOM supporter, you may know Lynette (Berger) Schmidt. Born in Fall River, Massachusetts, Lynette heard about the KNOM mission through her brother Normand. A Brother of Christian Instruction, Norm worked for KNOM for ten years, starting in 1975. Lynette (and a second brother, Damien!) joined KNOM as volunteers in 1982. Damien volunteered for two years, Lynette for three. Today, Lynette is KNOM�s Inspiration Director, producing most of our inspirational spots. If you have a favorite saying or prayer that you think would make a good radio spot, please send it to her. She�d be delighted! 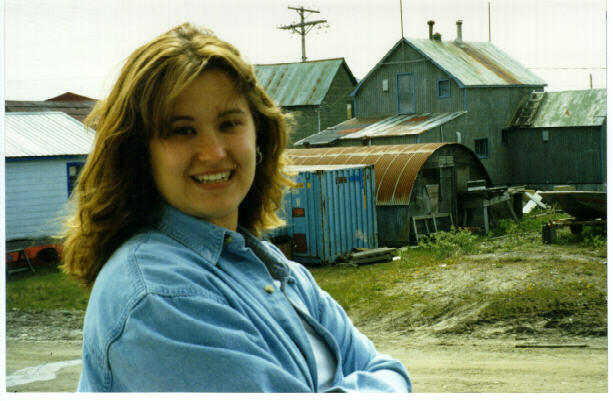 Lynette and her husband, KNOM Program Director Ric Schmidt, are active in Nome�s parish, and keep themselves busy raising their six children, ages 2 to 11.
hunger for You to those who have bread. DUBBING STATION UPDATE: In the past four weeks, we have received many contributions toward our dubbing station, a "mini" studio upstairs that for editing and transferring spots and programs to and from cassette and CD, without tying up the main, fully equipped studios. Here are the items the mission still needs. Can you help? INSPIRATIONAL SPOT: Old age is preparation for eternity. As parts wear out, they go back to the factory upstairs. When you finally get to pick them up, you will find the warranty extended to eternity. top VESTED INTEREST: KNOM News Director Paul Korchin was in the swing of things during Nome�s 100th birthday party in September, celebrating the anniversary of the discovery of gold in 1898. 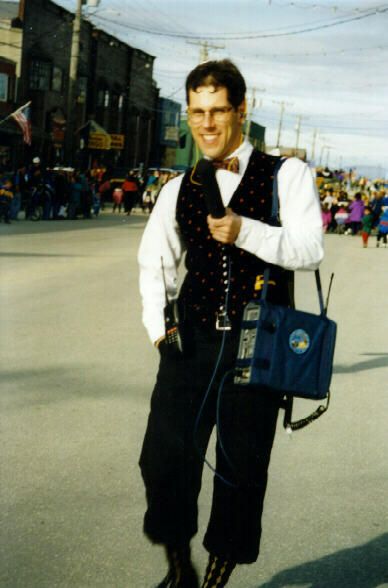 Nome enjoyed an unusually sunny day, and it was warm - in the high 40�s for the big parade, which Paul covered live over the air, transmitting to the studio using a portable remote unit, the same one we use for live Iditarod Race finishes. Paul wasn�t in the parade, but that didn�t stop the judges from awarding him the prize for "Best Man�s Costume," thanks to a Czechoslovakian vest, a bow tie and a creative hair style. KNOM volunteers Michael Warren, Jodi Engle and Vicki Muzik and Tom and Florence Busch�s daughter Kate were among 24 musicians who thrilled the crowd as they performed "The Washington Post March." Folks were especially excited, as it was Nome�s first marching band in at least forty years. INSPIRATIONAL SPOT: A lot of kneeling keeps one in good standing. top CRASHING FISH: As we reported last month, the catastrophically poor fishing this summer has left a majority of village families for hundreds of miles unable to pay their bills. Despite the stigma of asking for outside help, about half of the people in the Lower Yukon and Kuskokwim River deltas have requested aid. On the other side of the state, the National Guard was collecting pens, paper and pencils to supply 17,000 school children in our region, and the Red Cross and the state of Alaska were providing some emergency food, fuel and clothing. Meanwhile, fishermen in other areas who were successful have donated thousands of fish to hungry villages. Game officials opened moose hunting early in an attempt to keep food on tables, but many families were at the point where they could not afford to buy the food, ammunition and gasoline needed for hunting trips. Nobody knows why many salmon runs were so disasterously poor this year. Guesses range from foreign fleets on the high seas to some unknown pollutant or disease. ONE BRIGHT SPOT in this vast area is the KNOM signal. Thanks to you, we beam God�s Love in the form of inspiration, education, positive entertainment and companionship throughout village western Alaska, and across a large chunk of the Russian Far Eastern coast, too, every day, 24 hours a day. Thank you for your financial help and your prayers. It is you who makes KNOM possible.